L: 113.5" x W: 113.5" x H: 37"
Soft material with vivid fabric make this affordable sectional look high end and classy! I recently purchased the 3 piece L shape couch. I love how comfortable the couch is. The pillows really make the couch look like it belongs in my home. While, the couch might be slightly large, it is well worth it. Overall great couch and worth the money!!! It was delivered fast and men were extremely careful, and assembled it quickly. Looks even better than in showroom. Fits space perfectly with plenty of seating for all. Would definitely recommend this sectional for purchase!! It is beautiful in color (the gray is a silvery tone) and the fabric is very soft. The pillow backing are firm but not hard. The pieces hook together and are quite substantial. Love it!!!! Great look and great quality! Fits beautiful in front of our fireplace. We love it! How would you recommend cleaning this couch? Would it be a good choice with animals and small children? BEST ANSWER: Please refer to our recommend cleaning code: Lightly brush or vacuum frequently to remove dust and grime. Spot clean using a mild water-based solvent. Pre-test cleaning methods on a hidden surface. A professional cleaning service is recommended for an overall soiled condition. I used a wet rag on a spot after we spilled sauce and it cleaned up just fine. I have a cat who sheds an average amount and we have no issues with just vacuuming off the hair. Can this version of the 3 piece sectional sofa come as a sleeper? The sleeper option with the chaise is too large for our living space. BEST ANSWER: Yes, it can. The model in the store was a sleeper sofa in this layout. You would just need to decide whether you want a left side sleeper or right side sleeper. When I sat on it in the store, I felt like the cushions were comfy like the side that wasn’t a sleeper. Keep in mind, typically the cushions will be a bit firmer when you get your couch because it is brand new and hasn’t been subjected to people sitting on it like the model in the store, but give it some time to break in and the cushions will soften. I rotate my cushions from the typical areas that are sat in every day, to the other areas that are not so that they all stay even. While I did not purchase the sleeper, I will say that as a general rule of thumb, the cushions over the sleeper tend to not give as much because they don’t have the springs underneath given that the sleeper is there. If you go into the store, they have a paper that shows you all of the different pieces that the couch comes in so you can determine what configuration is best for you (e.g., cuddle corner, chaise, angled corner seat vs square corner, extra seats, etc.). 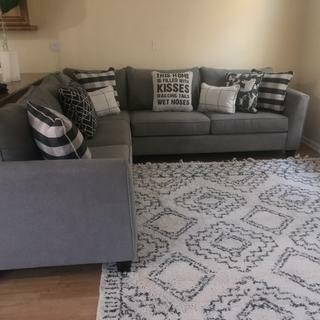 Overall, couch is great quality and we love it! Can you do this sectional as a two piece? Looking at the brochure.... it looks like you can? My room is too small to add the corner piece... but I could handle the 96" on my one wall with a LAF sectional and an 86" RAF sofa. BEST ANSWER: A different configuration can absolutely be purchased. For a 2-pc. sectional, maybe the right-arm-facing-sofa with left-arm-facing chaise or cuddler piece would work for your home? Our home furnishing consultants would be happy to assist make suggestions and answer questions you have about the Daine collection. Please contact 866.383.4484, option 3 for assistance! How much is the dog pillow? BEST ANSWER: There is one throw pillow in "Doggie Graphite" that is included with this sectional. If you would like to order additional pillows please contact your local showroom! Can it be ordered in a different color for additional charge? BEST ANSWER: We do not currently offer this sectional in any other fabric colors as of right now.